Very nice place, well maintained and clean. But I very much disliked the location. It is like about 1.5 miles from the city, uphill road, and the road is without pedestrian paths. No shops, nothing on the walking distance. You can't even take a stroll. We thought the property was well maintained and clean. We were there for a family wedding and the staff was simply fantastic. We really enjoyed the atmosphere and the rooms were very well equipped. The only slight issue was that the WIFI was weak and didn't work very well.... Which didn't really matter to us. Nice room, great view over the hill and sea. There wifi in the room. Very clean and spacious rooms. The view from the room was amazing. The pool area very relaxing and the staff friendly. The shuttle bus to the beach and the town was very handy. Great stay overall. Great hospitality! There is a comfortable shuttle service to the beach and to the town. wij verbleven hier maar 2 nachten op doorreis naar lefkada .had graag nog een paar dagen langer gebleven.ontbijt was prima,grote propere kamers..zeer vriendelijke ontvangst en personeel.groot zwembad met voldoende bedden. een aanrader. En général, l'hôtel est très bien et calme car en retrait du bruit du centre de Parga (un véhicule est souhaitable bien qu'une navette soit disponible). La literie est toujours confortable et les sanitaires fonctionnels. Bonne insonorisation. Piscine et bar très propres et accueillants. le personnel est agréable et disponible. La vue est toujours aussi magnifique. Quelques places de parking sont disponibles à l'intérieur. Bon point de départ pour découvrir les alentours (nombreuses plages, restaurants et sites touristiques). Lock in a great price for Alea Resort – rated 8.2 by recent guests! Just 2,650 feet from Valtos Beach, the year round Alea Resort features an outdoor pool and well-appointed studios and apartments with unlimited views of the mountain and Ionian Sea. Parga Village is within 1,950 feet. Opening out to a terrace or balcony, the tastefully decorated accommodations features a fully equipped kitchenette with cooking hobs and an electric oven. 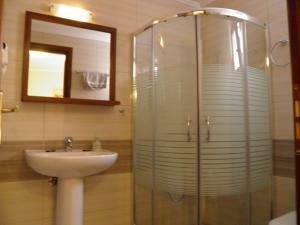 Other in-room facilities include air conditioning, a satellite TV, safety box and hairdryer in the bathroom. 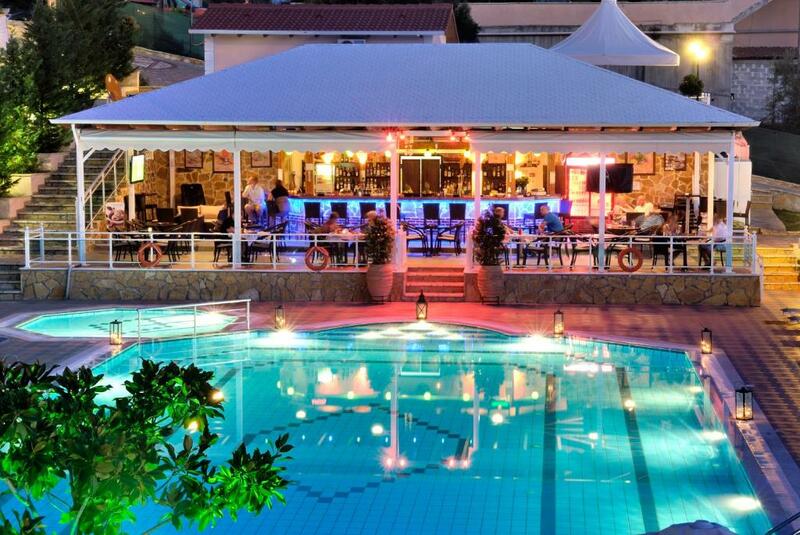 Guests of Alea Resort can enjoy a variety of meals at the à la carte restaurant or cocktails and light snacks at the pool bar. A continental breakfast is served each morning. Other facilities include a children's playground. Free Wi-Fi is available in public areas of the property. Alea Resort is 1.9 mi from the village of Anthousa. The port of Igoumenitsa is 29 mi away. Private parking is available onsite at no charge. 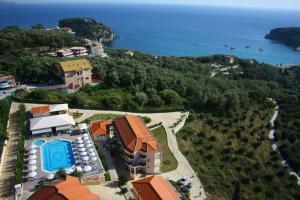 뀐 Located in the top-rated area in Parga, this property has an excellent location score of 8.0! 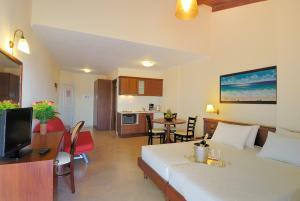 When would you like to stay at Alea Resort? Opening out to a terrace or balcony, this tastefully decorated studio enjoys unlimited views of the mountain and Ionian Sea. It features a fully equipped kitchenette with cooking hobs and an electric oven. Other in-room facilities include air conditioning, a satellite TV, safety box and hairdryer in the bathroom. Opening out to a terrace or balcony, this tastefully decorated apartment enjoys unlimited views of the mountain and Ionian Sea. It features a fully equipped kitchenette with cooking hobs and an electric oven. 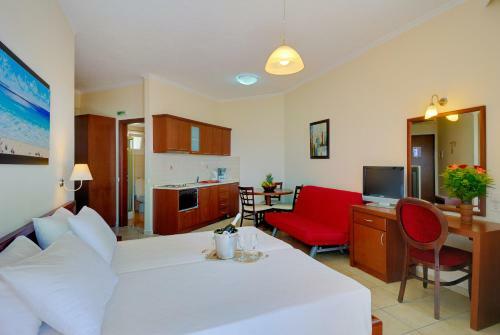 Other in-room facilities include air conditioning, a satellite TV, safety box and hairdryer in the bathroom. Offers sea views, fully equipped kitchenette, satellite TV. Can accommodate up to 4 extra people. Please check policies. Offers sea views, 2 bedrooms and living area with kitchen. Includes 2 bathrooms, satellite TV and 2 safety boxes. This suite can accommodate 2 extra guests. Please see hotel policies. The combination of natural beauty, total comfort, personal attention and its friendly, relaxed atmosphere make Alea Resort the most ideal destination for an unforgettable holiday ! With its peaceful scenery, rich with olive trees and overlooking the Ionian Sea. Alea Resort will captivate every guest. The magical sunset will inspire you while the golden sand beaches and crystal water will steal your heart for ever ! House Rules Alea Resort takes special requests – add in the next step! Alea Resort accepts these cards and reserves the right to temporarily hold an amount prior to arrival. Please note that late check out (until 6 pm) is possible for an additional fee. For me the beds were a little hard , but that’s only me , others thought they were fine ... a toaster in the room would be good , and also at the breakfast area . Felt like the hotel charged extra for as much as they could. No towels were available for the pool area - only for purchase. There were 4 of us in our suite and only 4 towels. No soap in the shower despite asking at the front desk. Wifi spotty . We arrived with our friends and family and reserved several rooms and each guest felt the same. The front desk , when open and staffed were complacent and disinterested. We would not recommend this hotel unless you wish to be nickel and dimed. Room withot view , beach is far then in describe.